I'd like to extend a warm welcome to our newest advertiser, Emergency Essentials! It's always cool to be able to offer readers a new source for products that can help with their preparedness efforts. We try to affiliate only with reputable companies that offer products or services that we believe embrace our values and a commitment to honest and friendly service. That's why Emergency Essentials is such a spiffy addition to our advertisers. They've been around for a long time and have a terrific reputation in the self-sufficiency/preparedness community. This company has good prices and great merchandise ranging from radios to pre-packaged food supplies. As their name implies, they're a one-stop stop of... well, essentials. But what appeals to the frugal mom in me is they have lots of special deals, including closeouts and group buyer's clubs that will save a ton of moolah. Even more neat (and I think this demonstrates their commitment to Preparedness) is the amount of freebies on their website. 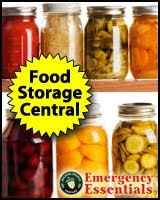 Have you seen their list of stored-food recipes? To someone like me who isn't the world's greatest cook, this resource is fabulous. They also have something called Insight Articles I'm happily perusing, which is jam packed with great prepping and self-sufficiency information. And signing up for their newsletter will get you all kinds of special offers. 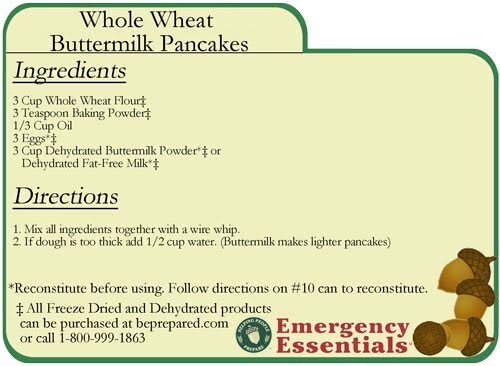 I'm delighted to welcome Emergency Essentials to Rural Revolution and I urge you to visit their web store. Even if you're not in the market for something right now, just the freebies will make the trip worth the visit. And you never know, you just might find something "essential" for your prepping. For example we just ordered some of the BurnFree Personal Burn Kits located in the closeout section. We've been looking for a good buy on this kind of product and we've found it at Emergency Essentials. Take a peek and see if you're not as impressed with this company as we are! Comgradulations. I have ordered from them before and was very satisfied. Seems like a great company. Future orders will be placed after linking to their web page from your site. Hope they track that kind of thing. Kudos! I have been ordering from them for about a year now and I couldn't be happier with their service and products! It is truly a one-stop-prep-shopping place. I get their catalogs! I pass them around at work. Same here, Terry. I was very happy with their service and products. My order shipped quickly too and, with the way the survival stores are being swamped right now, that's saying alot. I'll order through your website next time as well, Patrice. I've had very good service from EE. I really like their dry milk. Next to the Mormon cannery, EE is my number one place for preparedness shopping. I've been using them for almost 2 years and haven't had a single complaint. Lately their monthly specials go fast and end up on backorder, but thats par for the times. We got a lot of our grains from them! I am excited that you now are including them in your advertising. I have been ordering from them for almost a year now and have been completely happy. Like most people, my budget is limited, so I usually stock up using their specials. Because I live in southern California, I not only have to prepare for when the bleep hit the fan, but earthquakes as well. I know some people would see these two events as being the same, but they are not. One is TEOTWAWKI, the other is just the Earth throwing a fit. i have been browsing their website for a couple of years now and have been getting their catalogs for about the same amount of time. i haven't ordered anything yet but hopefully by the end of this month i can. from what i have seen on their website and in the catalogs the prices are really reasonable. i would highly recommend them, especially if you want mre's. they are the only company i have found that has just the individual mre components that you can mix and match (if you don't want a full mre). Love EE, have had a wonderful experiance with every order! !